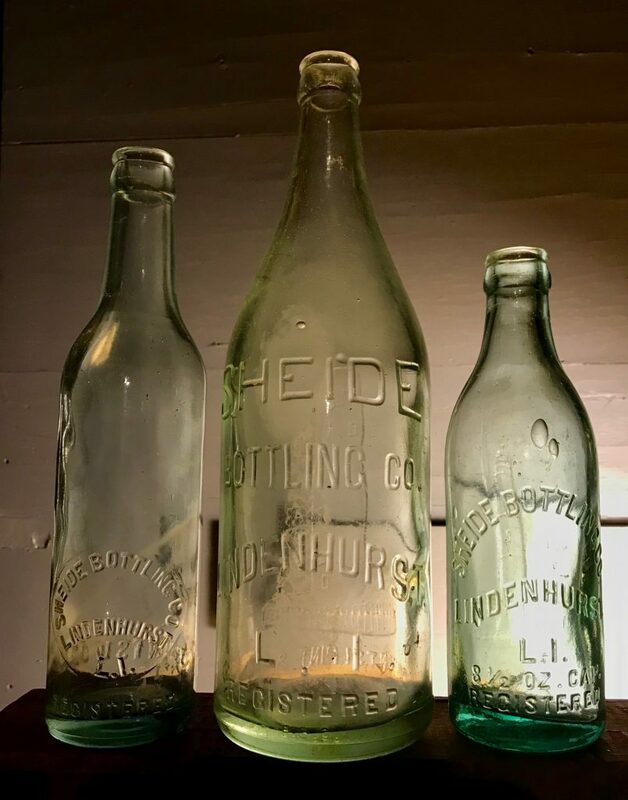 Sheide Bottling Co., Lindenhurst, L.I. Frederick Sheide was an interesting character. In addition to running a successful bottling business, he included politician, internal revenue agent, night club proprietor and bootlegger on his resume. According to a recent (July 13, 2016) issue of the “South Bay’s Neighbor” he started the Sheide Bottling Co. on May 1, 1900 with 5 employees. Between 1900 and the 1920’s the business appeared to be doing well and growing. The November 15, 1903 issue of the “American Carbonator and American Bottler” printed an item stating that: “The Sheide Bottling Co., Lindenhurst, Long Island, is a model establishment and does a nice business.” In October of 1910, Sheide became a member of the Long Island Bottler’s Protective Union and the November 26, 1915 edition of the “South Side Signal” stated that the company extended it’s route west from Freeport to Lynbrook and east from East Islip to Patchogue. Sheide also served as the local Suffolk County bottler for Ward’s “Orange (and Lemon) Crush.” This is confirmed in advertisements within several issues of the “Brooklyn Daily Eagle” between June and August of 1920. Frederick listed his occupation as bottler/mineral water manufacturer in both the 1900 and 1910 census. 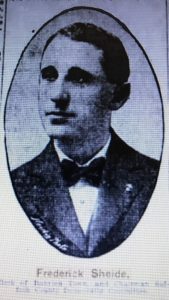 In the 1920 census, Sheide changed his occupation to “deputy collector internal revenue” and an August 8, 1920 story in the Brooklyn Daily Eagle referred to him as “the head of the internal revenue forces” in Patchogue Long Island. His wife Agnes listed her occupation as mineral water in 1920 so apparently they continued running the bottling business during this period. 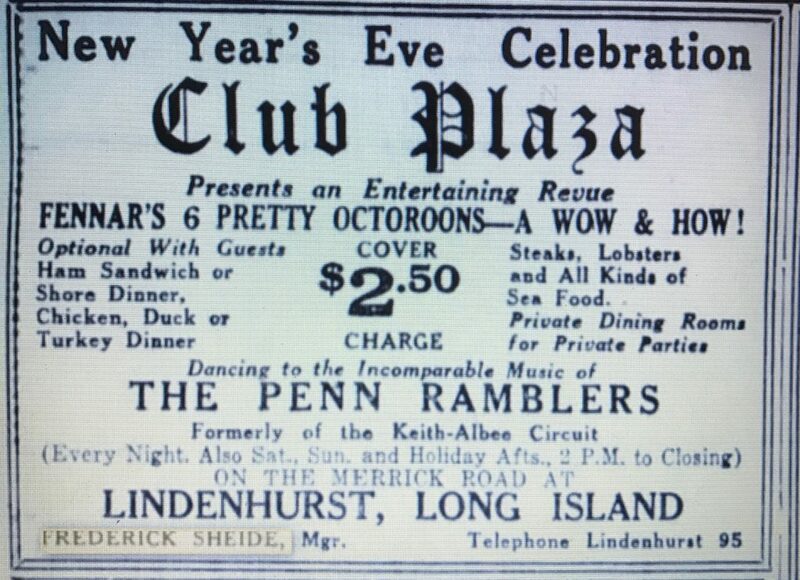 By 1927 Sheide was manager of the Plaza Roadhouse, a club on Merrick Road in Lindenhurst. This is confirmed by advertisements for New Years Eve Celebrations in both 1927 and 1928. Former Assemblyman Frederick Sheide, prominent Suffolk County Democrat, who once operated as Federal internal revenue agent out of Patchogue, today was arrested by Federal agents here while he was making a delivery of 10 half barrels of beer. The agents were not satisfied with a simple truck seizure and transportation charge against the former divisional chief. They went to Sheide’s Plaza Roadhouse here on the Montauk Highway and located a drop of 70 half barrels behind the main house. Despite the arrest, Sheide was still a Democratic Party leader in Copaigue, Long Island, at the time of his death in 1944. I’ve found a total of three bottles. Two were produced in private molds; one is a 27 oz. machine made and the other an 8 oz. tooled crown. Both exhibit a great image of a light house embossed on the back of the bottle. The third is machine-made that’s embossed utilizing a standard slug plate. It’s a rather odd-sized 10 oz. The machine made bottles were found in the western portion of the bays so I’m guessing they were made after the company extended its route to Lynbrook in 1915. Previous Previous post: George Sessler, Glenwood Landing, N.Y.